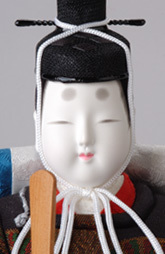 Ginga hina dolls are challenging works of Mataro doll. This Set could be said as a fruit of Japanese culture and great skills of Mataro artisans. For outfits, Mataro used fabric for real obi (kimono belt) interwoven with gold thread. 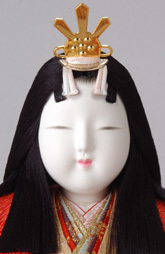 Please check the hairstyle and the sleeve edges of the Princess to see the differences with other dolls. *Please accept that the lights of this Set cannot be changed into paper-covered lamps in order to keep the total balance of the products.